Financial institutions are very in tune with the phishing threat and how it can damage their brand. I received this e-mail from ETrade yesterday. I’m a security expert and I recognize spam and phishing. I had to look this one over a few times to distinguish whether it was real or not. This isn’t helping customers. Instead, it’s training them to respond to *real* phishing mail by making phishing and real messages indistinguishable. Your discounted commissions on stock and options trades will expire in 7 days. You can still get extraordinary value when you trade with E*TRADE. We customize our commissions(1), making it easy to qualify for our best pricing. If you have any questions, please call 1-800-ETRADE-1 (1-800-387-2331) or log on to your account at http://www.etrade.com and contact us through the Help Center. 1. For details and additional information about our trading commissions and options contract fees, please visit http://www.etrade.com/commissions. (c) 2007 E*TRADE Securities LLC, Member NASD/SIPC (http://www.sipc.org). All rights reserved. The information contained in this Smart Alert does not constitute a recommendation by E*TRADE Securities, and is subject to the Smart Alerts Terms and Conditions (https://us.etrade.com/e/t/estation/help?id=1209038000) and the E*TRADE Securities Customer Agreement (https://us.etrade.com/e/t/estation/help?id=1209031000). We cannot respond to e-mails sent to this mailbox. If you have questions, please contact us through the Help Center (https://us.etrade.com/e/t/estation/help?id=1203000000). This entry was posted in identity theft, Opinion, phishing, spam and tagged etrade, LinkedIn, phishing, spam on October 25, 2008 by peterhgregory. Starting on August 28, I’ve been getting tons of email from people I don’t know, and I wasn’t in the recipient list either. Among the messages I received were the usual e-mail messages to groups of friends as well as e-mail from websites. Yesterday I saw a pattern when two specific recipients’ e-mail addresses were always in the To: line. I conducted a short experiment: I created email messages to each of the two recipients, and voila, those messages ended up in my inbox! In both cases, the user accounts were changed to forward all e-mail to me. Is this a new type of spam, or just coincidence? In both cases I have sent e-mail to abuse@<domain> asking them to turn off the forwarding. We’ll see what happens. This entry was posted in spam and tagged e-mail forwarding, email forwarding, spam on September 2, 2008 by peterhgregory. ETrade is teaching its users to respond to phishing scams. I am an ETrade customer, and last week they sent me the message below. ETrade isn’t helping its customers by sending messages like this, because it makes it all the more difficult for customers to distinguish genuine messages from phony ones. On 03/26/08, your E*TRADE Securities account will be charged a $40 Account Service Fee (ASF) (https://us.etrade.com/e/t/estation/pricing?id=XXXXXXXX). If your account does not have enough funds to pay for the fee, E*TRADE Securities may sell securities in your account to cover the charge. If you have questions about your account, call 1-800-ETRADE-1 (1-800-387-2331) or send a secure e-mail through the Help Center (https://us.etrade.com/e/t/estation/help?id=1203000000). (To call from outside of the U.S., dial +1-678-624-6210). The E*TRADE FINANCIAL family of companies provides financial services that include trading, investing, cash management, and lending. Securities products and services are offered by E*TRADE Securities LLC, Member FINRA(http://www.finra.org/)/SIPC(http://www.sipc.org/). (c) 2008 E*TRADE FINANCIAL Corp. All rights reserved. The information contained in this Smart Alert is subject to the Smart Alerts Terms and Conditions (https://us.etrade.com/e/t/estation/help?id=XXXXXXXX). We cannot respond to e-mails sent to this mailbox. If you have questions, please contact us through the Online Service Center (https://us.etrade.com/e/t/accounts/servicecenterhome). This entry was posted in phishing, responsibility, Risks, spam and tagged etrade, phishing, scam on March 18, 2008 by peterhgregory. There is lots of activity around an email and a fraudulent Microsoft Update web site (that the email directs you to), claiming that there is an urgent Microsoft update. The web site looks like a legitimate Microsoft site and contains an “Urgent Install” button that, when clicked, attempts to download and install malicious software on your system. The file that attempts to download is not signed by Microsoft and is called “WindowsUpdateAgent30-x86-x64.exe”. This web site is using fast flux DNS for its web hosting. That make it hard to track and close down, so we expect it to be around for awhile. Please advise your users, if they receive this type of email, they should just delete it. Microsoft does not distribute updates by sending emails directly to individuals or distribution lists. Credit to NW WARN for the contents of this advisory. This entry was posted in Anti-Virus, incidents, spam, Tips and tagged fraud, microsoft update, urgent install, WindowsUpdateAgent30-x86-x64.exe on February 8, 2008 by peterhgregory. “After the last annual calculations of your fiscal activity we have determined that you are eligible to receive a tax refund of $134.80. 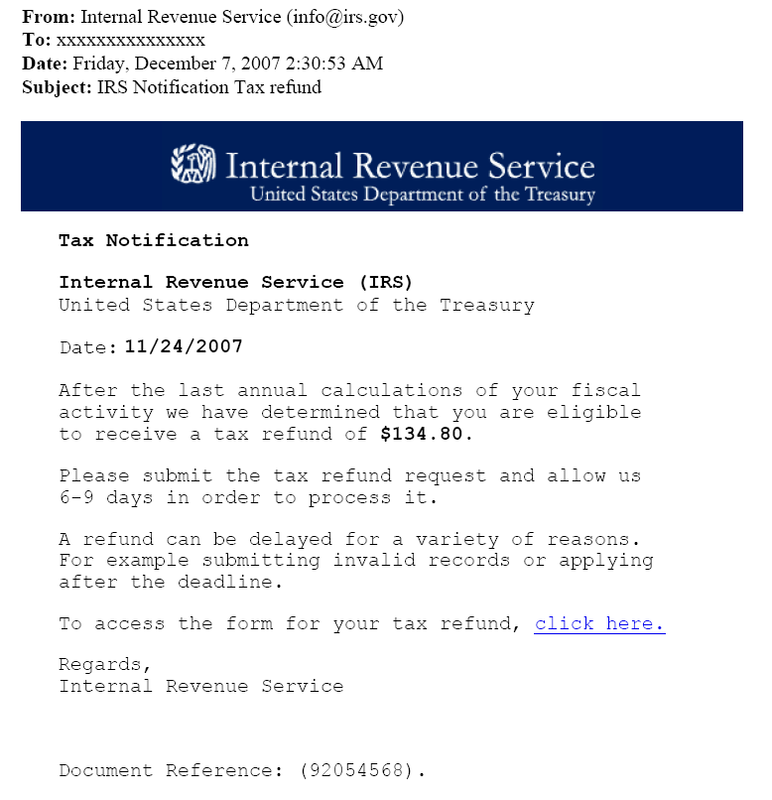 To access the form for your tax refund, click here. When you receive messages like this that claim to be from a government institution or financial institution, it’s probably a phony. The best thing to do is mark the message as spam and delete it. This entry was posted in identity theft, spam, Tips on December 7, 2007 by peterhgregory.